Director Risa Brainin, center, and playwright Cheryl West, right foreground, collaborating on "The Watsons Go to Birmingham - 1963"
Birmingham, Alabama. Sixteenth Street Baptist Church. September 15, 1963. A bomb explodes before Sunday morning services, killing four young girls from the predominately Black congregation, injuring many others, spawning a riot — and shining a glaring, national spotlight on the increasingly volatile fight for civil rights. That horrific, real-life event is central to the story of acclaimed children’s novel “The Watsons Go to Birmingham — 1963,” which explores the effects of trauma and the healing power of family from the perspective of its 10-year-old narrator, Kenny. The 1995 book by Newbery Award-winning author Christopher Paul Curtis has been newly adapted for the stage by the playwright Cheryl West. It will preview Feb. 14–24 at UC Santa Barbara, as a production of noted play development program LAUNCH PAD. 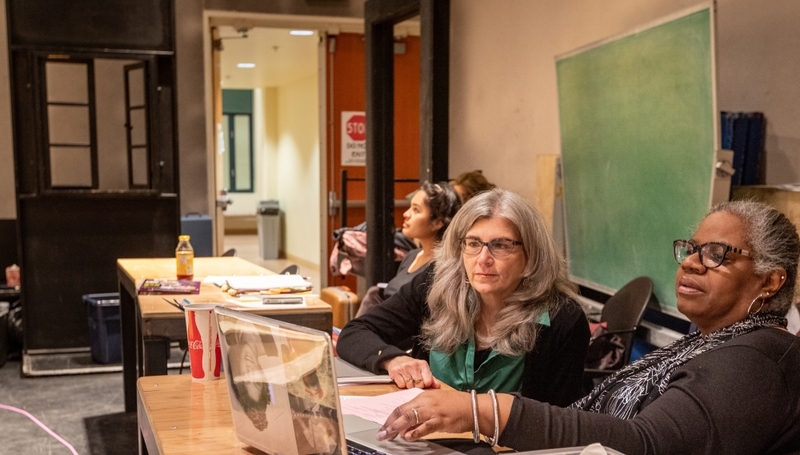 Both Curtis and West will appear on campus Friday, Feb. 15, at an associated conference meant to explore literary and theatrical representations of Black histories. In a LAUNCH PAD first, the program co-commissioned West’s adaptation with Seattle Children’s Theatre and Chicago Children’s Theatre. The resulting family-friendly preview will debut at UC Santa Barbara then shift to Chicago in the spring for a second production and a third incarnation Seattle in 2020. The companion symposium, “Timely Intersections: Black Histories on the Page and Stage,” was inspired as much by the new production of “The Watsons Go to Birmingham — 1963” as by the original book. It was conceived by UC Santa Barbara faculty members Christina McMahon and Stephanie Batiste, who sought to convene academics, authors and artists to consider how Black histories are repurposed and reimagined as they move across mediums — and to examine Black histories as both a conduit for social change and a mode of education. An interview with novelist Curtis, playwright West and Brainin is the final segment in the symposium, which also features a roundtable on bringing Black histories into classrooms; a panel discussion on translating Black stories for young readers; and a keynote talk by scholar Julius Fleming (University of Maryland), who specializes in African Diasporic literature and cultures with a focus on performance studies. 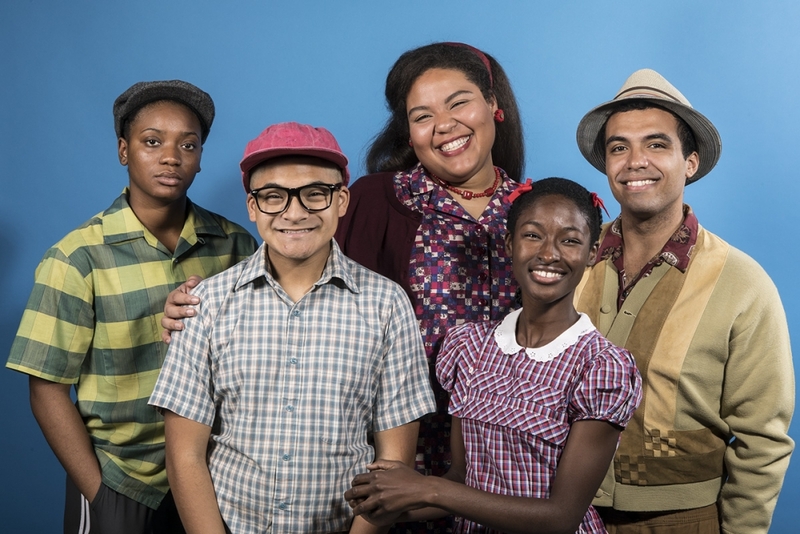 The LAUNCH PAD production of West’s piece, as in Curtis’s groundbreaking book, centers on a quirky and loving Michigan family of five, “The Weird Watsons” as they’re known, traveling south to Alabama in 1963. When their grandmother’s church, 16th Street Baptist, is bombed in a racially motivated act, 10-year-old Kenny Watson is emotionally upended. And it’s his family who brings him back. For West, her adaptation was informed as much by current events and today’s social climate as it was by the past. “Our country has in many ways progressed and yet has taken a giant step back in terms of inclusivity and tolerance,” she said. “The level of tribalism and racism is striking in its violence. Daily, our children are exposed to images and discussions that promote separation instead of unification. And yet we ask our children to stay innocent and loving and available to meet the world on its own terms. But at what cost? How might they survive the emotional cost and the fear that it could happen to them? My take on the Watson story was to ask these questions, to examine the response to trauma in children’s lives and how imagination and a family’s love is always on the road to healing. 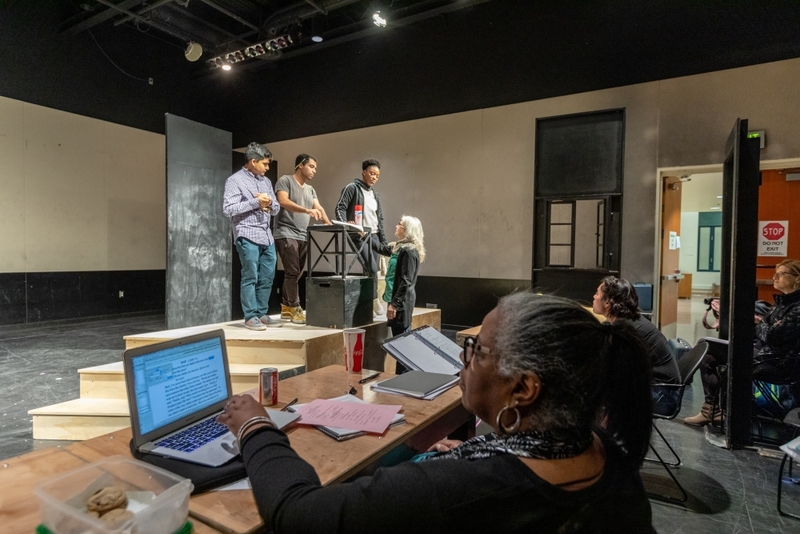 The LAUNCH PAD production of “The Watsons Go to Birmingham — 1963” will show at 8 p.m. Feb. 14-16 and Feb. 19-23, and at 2 p.m. Feb. 23-24 in UC Santa Barbara’s Performing Arts Theater. The Timely Intersections conference will begin at 1 p.m. Friday, Feb. 15, in the McCune Conference Room, 6020 Humanities and Social Sciences Building.